During installation, Setup tries to contact the other components to validate that the service is running. For the contact to function correctly, remote administration must be activated in Windows Firewall. To turn on remote administration, start Windows Firewall in Control Panel, click Allow a program through the Windows Firewall, and then click Remote Administration. The FIM Synchronization Service consists of the metadirectory, provisioning engine, and management agents (MA) for various connected data sources. It supports synchronization of data between the FIM Synchronization Service database and other identity stores in the enterprise. During the installation of the Synchronization Service, the firewall on the server hosting this service is configured to allow Dynamic RPC and RPC endpoint mapper access to the FIM Synchronization Service. The FIM Synchronization Service creates five security groups. The first three groups correspond to the FIM Synchronization Service user roles: Administrator, Operator, and Joiner. The other two groups are used for granting access to the Windows Management Instrumentation (WMI) interfaces: Connector Browse and Password Set. By default, the FIM Synchronization Service creates the five security groups as local computer groups instead of domain global groups. 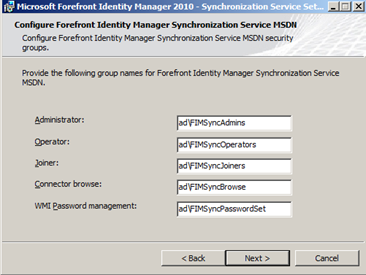 If you plan to use domain global groups, you must create the groups before you install the FIM Synchronization Service. Using ADUC – I made these groups ahead of time. 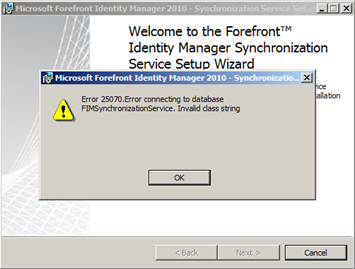 Only one FIM Synchronization Service instance can exist in a deployment. 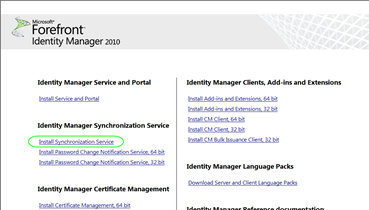 On the FIM 2010 startup screen, click the Install Synchronization Service link. Important: Make sure all installs are done with elevated privileges and the account has the correct rights or installation may fail. On the Group Information page, when you are prompted for the five security groups, enter in the inforamtion for the Domain Global groups made earlier. 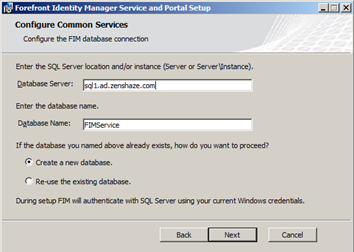 Installing the FIM Service installs the Web services parts of FIM 2010 and also configures the FIM Service database on the server that hosts SQL Server 2008. During the installation of FIM Service, port 5725 and 5726 are opened and exceptions for these ports are added to the Windows Server 2008 firewall settings. 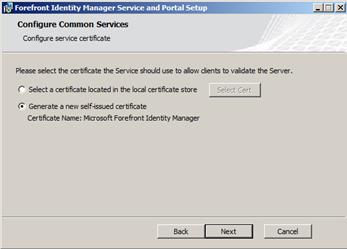 Opening these ports permits communication to the FIM 2010 Service from the FIM Portal, FIM Password Reset Portal, FIM Synchronization Service and FIM Password Reset Extensions components installed on other computers in your organization. 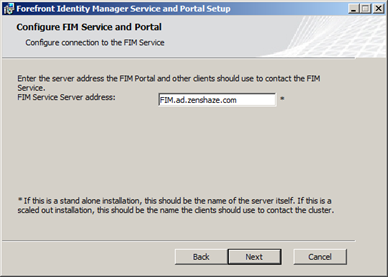 On the FIM 2010 startup screen, click the Install Service and Portal link. On the Custom Setup page, you are prompted for the applications that you want to install. On the Configure Common Services page, in the Database Server box, type the name of the server that hosts SQL Server 2008. 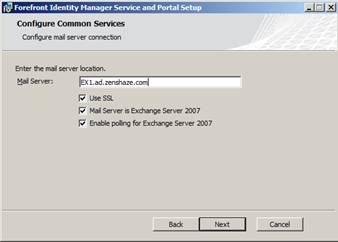 On the Configure Common Services – Configure mail server connection page, in Mail Server, type the name of the server hosting the Exchange Web services. 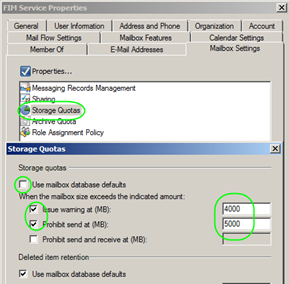 If you have several FIM Service servers using the same database, ensure that you select only the Enable polling of Exchange Server 2007check box on one of the servers. 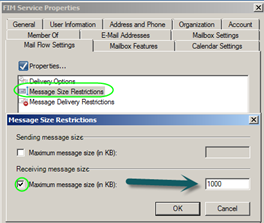 This setting is also applicable for Exchange 2010. This server is responsible for obtaining e-mail messages from the Exchange Web Service interface and turning them into requests. 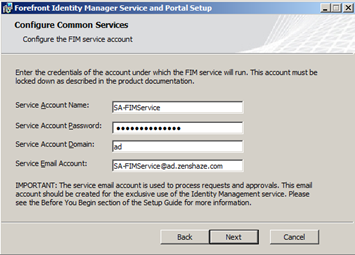 On the Configure Common Services – Configure the FIM service account page, provide the credentials for the FIM domain service account. 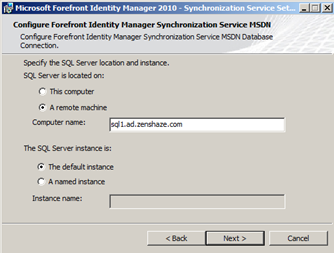 On the Configure Common Services – Configure the Forefront Identity Manager synchronization connection, in the Synchronization Server box, type the name of the server that is hosting the FIM Synchronization Service component. In the FIM 2010 Management Agent Account* box, type the domain\account of the FIM MA account. 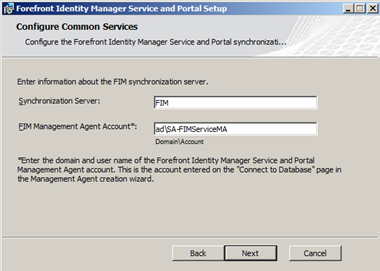 In Configure FIM Service and Portal – Configure connection to the FIM Service, type the name of the server that the clients should use to contact the FIM Service. 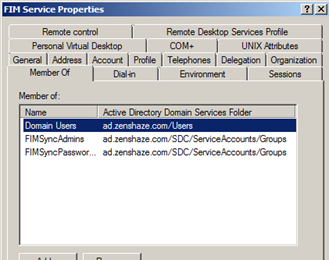 The names should match the Service Principal Names (SPNs) that you created in the preinstallation tasks. 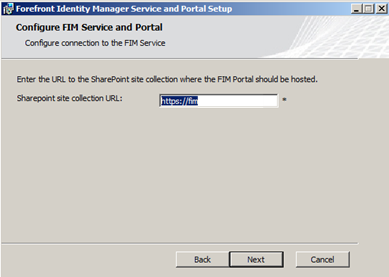 In Enter the URL to the SharePoint, type the address to the SharePoint site where the FIM Portal should be installed. This is the full address, including the port number, if necessary, to access the site collection. This address is whatever you set it to when you setup the sharepoint server. To add to the list of known addresses, start SharePoint 3.0 Central Administration, and navigate to Operations, Alternate Access Mappings, Edit Public Zone URLs. 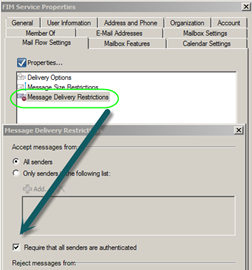 Add the URLyou want to use to the Intranet zone, leaving the Default zone with the SharePoint server farm address. This name must be stable, and clients must be able to resolve it to the IP address of the server where the FIM Service is installed. This server name is also used by password reset clients to reach the server. 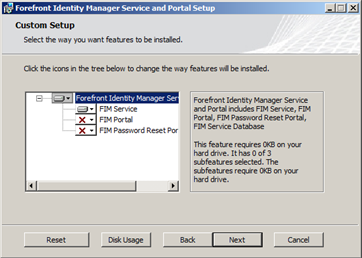 After you install the FIM 2010 server components, you must complete several configuration tasks. Updates for FIM are posted on Microsoft Update. Ensure that you install the latest update from Microsoft Update. The download you want is mid way down the page. Add the service account used by the FIM Service to the FIMSyncAdmins group. 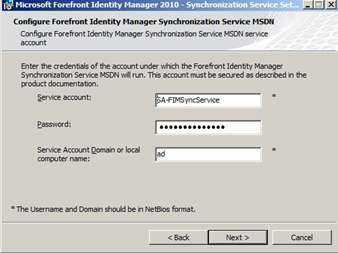 This allows the FIM Service to configure the FIM Synchronization service. 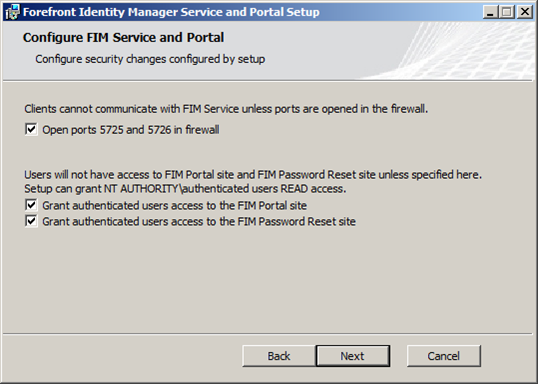 If you plan to use the Password Reset feature of FIM 2010, add the service account that the FIM Service uses to the security group FIMSyncPasswordSet. So that the group membership is effective, restart the FIMService service. Where I work we never prohibit receive as that could effect business . 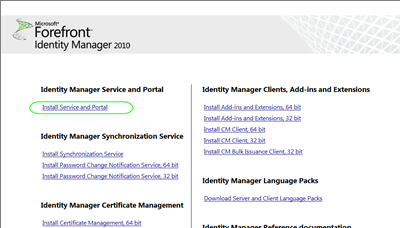 On the server that hosts the FIM 2010 Portal, click Start. In the All Programs list, click Administrative Tools. Under Administrative Tools, click SharePoint 3.0 Central Administration. On the Central Administration page, click Operations. On the Operations page, under Global Configuration, click Timer job definitions. On the Timer Job Definitions page, click SharePoint Services Search Refresh. It is highly recommend that you turn off portal authentication that uses NTLM. The Kerberos protocol is a more secure protocol to use. Open the Web.config file, which is usually located at C:\inetpub\wwwroot\wss\VirtualDirectories\80. Note : You need an elevated command prompt or Windows Explorer to access this folder.